Reviews & for our Co-Producer's acclaimed book: "A Feathered River Across the Sky"
"Compelling and cautionary...we get chilling history...filled with information and passion and does a remarkably good job of using computer-generated animation to show us what it must have been like to see a passenger pigeon flock." "A masterly combination of interviews with modern authorities, historical documentation, and scenic views of areas where these birds formerly darkened the skies...A brilliant account of an uparalleled conservation tragedy...Highly recommended." Full of gorgeous cinematography..compelling and beautiful...a call to action for birders and anyone else who values the natural world." 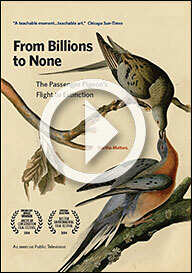 This award-winning film follows naturalist and author Joel Greenberg, A Feathered River Across the Sky: The Passenger Pigeon's Flight to Extinction, (Bloomsbury USA, 2014), as well as scientists, artists and teachers that are drawn to this literal teachable moment and its striking relevance to conservation challenges today. The "De-extinction" movement and its plan to bring back the passenger pigeon, is briefly explored. Highlights include breathtaking CGI animation of massive flocks, as well as astonishing aerials captured by remote control quadcopters equipped with GoPro cameras. From Billions to None garnered a Broadcast Award from the 2014 American Conservation Film Festival; the award is given to films with "compelling conservation issues that educate, motivate and inspire viewers."